Remember that little sneaky peek from my post on Friday?...Well, here's the full card. This one uses the new Branches mini set from There She Goes. You'll be able to purchase all the new sets as of tomorrow! The main image was stamped in Versamark on PTI Select White CS, and then heat embossed with Detail Gold EP. The edges are sponged with Ranger Distress Ink, Vintage Photo. The Chocolate Chip mat behind the main image is popped up on 1/8" thick foam tape. The layout is one of Jen Del Muro's awesome SFYTT sketches. I stamped the inside of the card with the same branch all around the edges in Versamark. Hi everyone. 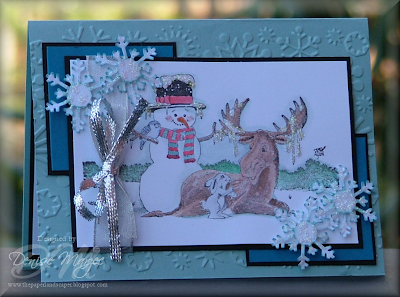 It's time for another OCC Challenge, and today the challenge is to make a card/project using a snowman or snowflakes. 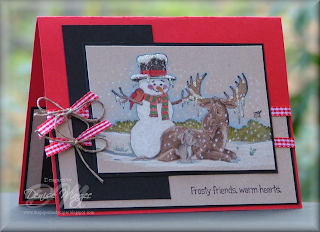 Be sure to hop over to the OCC blog to check out the samples from the OCC crew, and to see the fun card made by our special guest (and my good friend) Janice Melton. Thanks for being our guest today, Janice! I made two cards for today. The stamp is from Cornish Heritage Farms, part of the Friendly Kritters Collection. The images were stamped in Versafine Black Onyx and watercolored with inkpads/reinkers. The icicles and snow were done with AIG Dries Clear Adhesive and Starfire Glitter from Taylored Expressions. The snowflakes on the blue card were punched from white CS with a Martha Stewart punch, sponged with Baja Breeze Ink, and then I added the same Starfire glitter. They were glued down with SU Dimensionals. All ribbon on the blue card is from Papertrey's Silver Collection. The hemp twine on the red/green card is tied around celery May Arts ribbon that I got at Stamper's Dream and striped organdy ribbon from Pink Hedgehog. The sparkle in the organdy ribbon matches the starfire glitter perfectly! Love that! The Warm Hearts sentiment was stamped on the inside of both cards. Here's a picture of the inside of the red/green card. The blue card is pretty similar, just white CS matted against black. Hi all and Happy Friday!! Here's a card I made using the new Crafty Taglines set from There She Goes. All of the new sets will be available for purchase on Monday! Oh, and don't forget, Jessica has a fun challenge that you're all welcome to play along in. Just make a card and beautify the inside. When uploading to SCS, be sure to use TSG01 in the keywords field so we can see your stuff. I wanted to mention a bunch of stuff going on at Taylored Expressions. First, Taylor is having a SALE this weekend that'll run through Sunday night, November 30th. For orders over $40, you'll receive FREE shipping...AND...JustRite products are BOGO. Second, just a reminder that the next Top Chef deadline is December 12th. Create a card or project using any of the SASI Christmas Holiday stamp sets and e-mail a photo to Taylor at tayloredexpressions@gmail.com on or before December 12th to be entered into the contest. Please use Top Chef in your e-mail subject line. 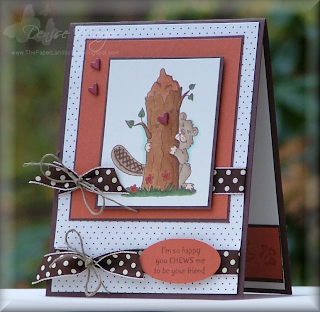 Taylor will choose the cutest, most creative entry to win your choice of stamp set from the next SASI stamp release!!! Free rubber! WooHoo!!!! Hi everyone and HAPPY THANKSGIVING!! So what kind of pie will you all be having today? It's a toss up for me between pumpkin and pecan pie...hmmm, maybe a slice of each, LOL! Yeah, I know...slow down, girl! 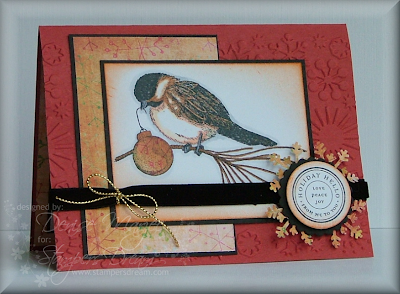 Today I got to play with some Northwoods Wreath, Birds, and Sled images that my sweet friend Tosh stamped for me. Thanks, Tosh!! You're the best! If you want the stamp, hurry over to Stamper's Dream because all holiday stamps are on SALE through this Sunday, November 30th for 15% off!! Just enter coupon code HOLIDAYS on the checkout page. The card measures 5.25" square. I used three stamped images on this card. One full image was watercolored for the front, and then I watercolored just the red bow on two more images, cut them out, popped one up on dimensionals over the front image and the second one was glued to the inside of the card (see pic below). The Kraft mat behind the main image is also up on Dimensionals. I used Liquid Pearls on the snow. The inside of the card basically follows the same layout as the front. I used one of the sentiments from my JustRite Christmas Stamp Ensemble with the Harmony Rectangular Stamper, stamped in Riding Hood Red. Don't forget, this week at Stamper's Dream, selected JustRite products are on sale for 50% off! Jessica Knutsen at There She Goes is releasing a bunch of new stamps this week! She's showing sneak peeks on HER BLOG this week, and the new sets will all be available for purchase as of December 1st. Hi everyone! 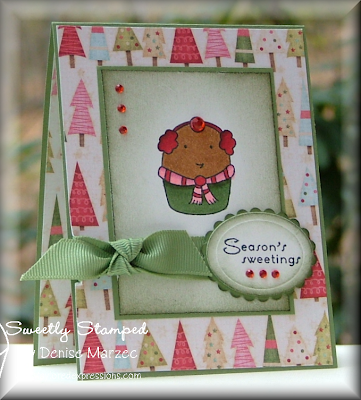 I have two cards to show you today using the adorable SASI cupcake stamps from Taylored Expressions. The first is for today's SCS Sketch Challenge (SC204). The DP, red organdy ribbon, and prism papers are all from the Christmas Key Ingredients pack. The image was stamped onto Poison Ivory Shimmer CS and colored with Copic markers. I saw my good friend Dawn (hi, Dawn!) do this on one of the OCC challenges and she said how the shimmer shines through the coloring. She was right! This looks so pretty IRL. I added some Platinum and Candy Cane Stickles to the image, and the whole panel is popped up on 1/8" foam tape that I got at Taylor's store. It stands higher than the SU dimensionals. The next card is for Taylor's Sketch #TECC43 from last Friday. The green Prism paper, DP, and ribbon are all part of the Christmas Key Ingredients pack. The red ZVA rhinestones are also available at Taylored Expressions. 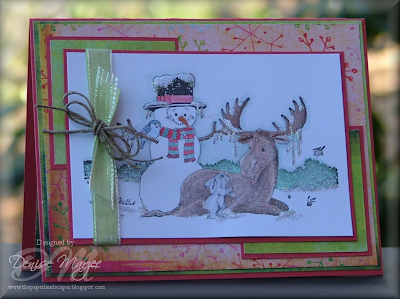 The main image was stamped onto Cryogen White Shimmer CS and colored with Copic markers. The edges of the main panel and the white oval sentiment were sponged with Always Artichoke ink. The sponged oval sentiment is up on SU Dimensionals and then the green scalloped oval behind it is just glued down with regular adhesive. One more day 'til Turkey Day!! Yahooo!! Are you excited as I am? My husband and I have been on the South Beach diet for over two weeks now (and it's going really well...I've lost 4 pounds so far and DH has lost 9 pounds), but we're so ready to just have a slice of pie (real pie with real sugar, LOL!). Hi all! I wanted to make a card today, BUT...the day totally got away from me. Hopefully tomorrow I'll have something to show you. Real quick before I go, I wanted to mention that Michelle now has even more products on SALE at Stamper's Dream!! She's still running the 15% off of all holiday stamps, but now she's ALSO offering selected JustRite products at 50% off!! Check it out on HER BLOG or by clicking HERE. Hey all, just a quick post to let you know that Sarah Kay stamps are now available at Stamper's Dream! Yay! I love Sarah Kay stamps! Click HERE to see which ones are currently in stock as of today. AND....Michelle has ordered some of the newest Collection II Sarah Kay stamps. They're not in yet, but keep an eye out in the store because those should be arriving shortly! Two Holiday Cards ...and a SALE! Hi everyone! How are you this fine Monday morning?? 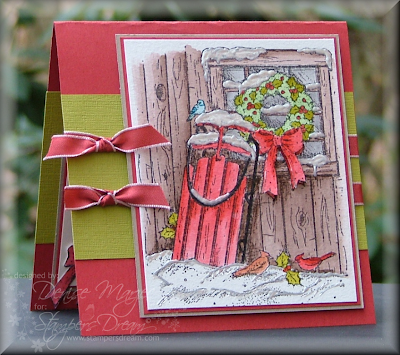 I have something exciting to share.... Michelle Rodgers is having an awesome holiday sale at Stamper's Dream. Now through November 30th ALL holiday stamps are 15% off. All you have to do is enter coupon code HOLIDAYS on the checkout page!! How cool is that?!! 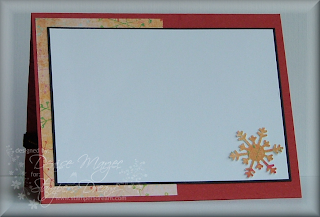 The card base was embossed with my snowflakes cuttlebug folder. The chickadee was stamped in Memento Tuxedo Black and colored with Copic markers (see recipe for numbers). I stamped a second image on the Fancy Pants Happy Holidays DP (basically just the side of the image with the ornament), cut out the ornament, and paper pieced it over the image. The edges of the main image were sponged with Pumpkin Pie ink. The gold metallic string (love this stuff!) and black velvet ribbon were glued down with sticky strip, and the velvet ribbon wraps all the way around the card. The sentiment was stamped onto white CS, cut with a circle Nestabilities die, sponged with Pumpkin Pie ink and then matted against a black scallop circle Nestabilities die. I punched four snowflakes using my Martha Stewart snowflake punch in the Fancy Pants DP, glued them to the back of the black scallop circle, and then glued down the whole layered sentiment with dimensionals. 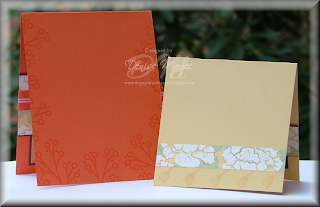 The layout is Beate's Weekend Sketch #67, and the inside of the card follows basically the same layout. The second card is the Artful Stamper Cat Nap stamp. I just wanted to make another Christmas card with this adorable image. Love that cat's sweet face. My grandmom has an orange cat so I think this one will go to her this year. I started with an 8" x 8" piece of Riding Hood Red CS and folded it in half. This size fits nicely into a regular #10 envelope. The Cat Nap image was stamped in Versafine Black Onyx and watercolored with a damp watercolor brush and inkpads/reinkers. The bell was colored with Golden Opal Twinkling H20's. The edges were sponged with Pumpkin Pie ink, mounted against Basic Black, and popped up on thick foam tape from Taylored Expressions. The red rhinestones were all glued down with a small dot of Crystal Effects. Have an awesome day, and don't forget to check out the sale! Today I thought I'd use some of my new Crafty Secrets stamps and cotton scraps. This is the first time I've used the cotton scraps and they're really cool!! The main image is part of their Romance Cotton Scraps sheet. The black and white photo has a pink tint to it that's really cool. I love it! It's very sweet. The heart from the Large Cherish set was stamped in Versamark onto SU Basic Gray CS and then heat embossed with pink embossing powder. I cut it out and popped it up on dimensionals. I layered some pink striped organdy ribbon from Pink Hedgehog Paper Crafts in front of some black grosgrain ribbon. The pink swarovski crystals were glued down with a small dot of Crystal Effects. The inside of the card uses more stamps from the Large Cherish set. I love these little accent stamps...so pretty! What an awesome theme Judy thought of today for the Limited Supplies Challenge (LSC195)! 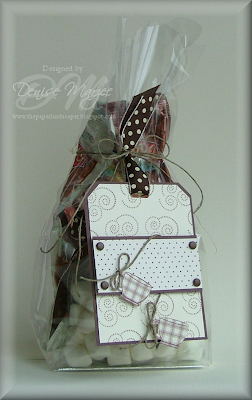 !....make a project with some sort of chocolate theme....chocolate colored ink or paper, a chocolate-related stamp, etc. Thanks Judy! Loved this...and I love that book too! 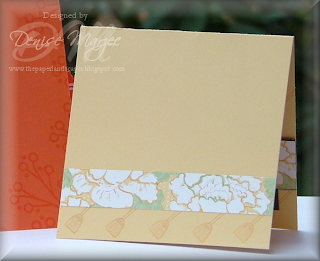 My tag was inspired by one that I saw on the Stampin' Up Home Page. A tag was made with two mittens dangling around the horizontal strip. Well, I used these cute little cups from There She Goes instead of mittens. The Vanilla tag is 2.5" x 3.5", matted against a piece of Chocolate Chip CS that's 1/8" larger all around. I stamped four teacups in Memento Cocoa (two of the right-facing cups and two of the left-facing cups) onto the Chocolate Remix DP, cut them out, and glued two together back-to-back...that way if they flip when dangling, it still shows a finished side. I strung them on hemp twine and looped the twine around that horizontal strip. The horizontal piece of Chocolate Chip and Dark Chocolate DP is up on dimensionals. ...now go have some hot chocolate. It's snowing here in PA today so it's just the perfect day for it too!! Hi everyone! This month's Dreamy Challenge is from Tosh and she's challenging everyone to make a fall card with some sort of "window" on it. You're all invited to play along....AND Michelle is having another GIVEAWAY!! You can see a picture of the prize on her blog. To enter, just link your project in the comments section of Michelle's blog. If you upload to SCS, use SDDC2 in the keywords. My card is a 4.25" square card. The base is Textured Tangerine Tango. I layered the Haiku DP, Old Olive, and More Mustard colors together and then cut out a circle with one of my Nestabilities dies. I added the May Arts Olive Ribbon and Gold Metallic string, and then that entire DP layer was glued down with 1/8" thick foam tape that I got at Taylored Expressions. Next I used my JustRite Circle II Stamp Ensemble and stamped the Thanks sentiment in Versamark, and heat embossed it with JudiKins Detail Gold embossing powder. I cut that out with a circle Nestabilities die and then matted it against an Old Olive scallop circle. The Old Olive scallop circle is up on 1/16" SU Dimensionals, so the sentiment doesn't stand as high as the layered DP square. The JustRite "Thanks" Stamp, May Arts Olive Ribbon, Gold Metallic string, and JudiKins Detail Gold EP are all available at Stamper's Dream. Don't forget to check out what the rest of the Dream Team has for you today: Charmaine, Cindy, Kimberly, Michelle, and Tosh. Hi everyone! Happy hump day. Wanna see the rest of the project? 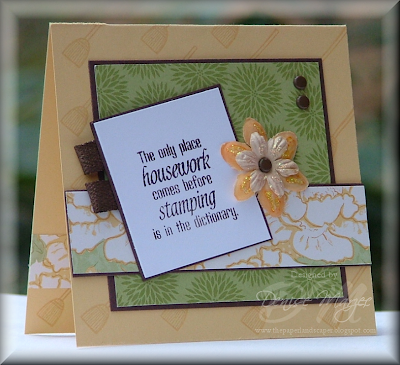 Check it out on the Stamp a Sweet Impression blog. Oooooh, how I love this stamp! So adorable...there's just something about an outdoor scene of animals that I love. It's from Cornish Heritage Farms, part of their Friendly Kritters collection. So is the sentiment. I used the colors in today's Color Challenge CC193 on SCS. The image is stamped in Versafine Black Onyx onto Kraft CS, and then watercolored with inkpads/reinders. After watercoloring, I used a white Prisma pencil to color in the snow and falling snowflakes. The sky was also done with a Prisma pencil. I added some AIG Dries Clear Adhesive to the snow and icicles on the hat and antlers, and then sprinkled on some of Taylor's Starfire Glitter. The picture doesn't capture just how sparkly this stuff is. I love it! The inside of the card follows the same layout as the front of the card, which by the way is Taylor's Sketch TECC40. 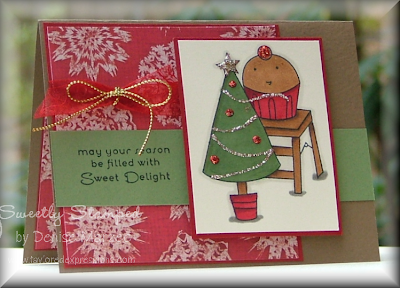 The sentiment on the inside is from Taylor's Season's Sweetings stamp set. Hi everyone! Hope you're enjoying your weekend. 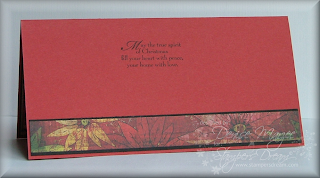 Today's Featured Stamper on SCS is Kendra. I chose THESE CARDS of hers to CASE. Love the layout with the fun ribbon in the corner. I added some layers, changed the colors by using my new Fancy Pants Happy Holidays DP (fun stuff! ), and used my Artful Stamper Cat Nap stamp (stamps beautifully every time..always a clean image). The image was stamped in Versafine Black Onyx and then watercolored with ink pads/reinkers and a damp watercolor brush. I painted the bell with Golden Opal Twinkling H20's and added some Frosted Lace Stickles around the edges of the santa hat. I added some shading to the bottom of the image with Basic Black ink. You can click on either picture to see a larger view. 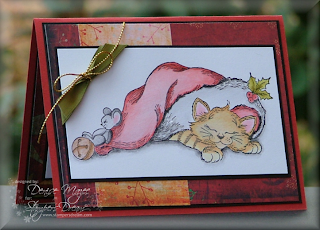 The Cat Nap stamp, Fancy Pants DP, Frosted Lace Stickles, gold metallic string and the olive May Arts ribbon can all be found at Stamper's Dream! Hi all! Time for another OCC challenge! Today the challenge is to make something using silhouette stamps....and as an added optional sorta thing, sparkle too! Be sure to stop by the OCC blog to check out the samples from the OCC girls AND to see what our special guest designer this week, Silke Ledlow (sparklegirl herself!) has made for you to feast your eyes on. 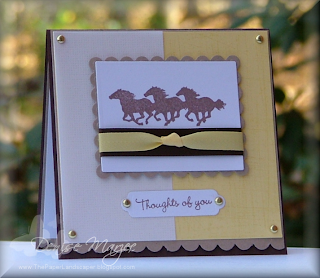 I wanted to make another card for Laurie's daughter, and rumor has it she loves horses...so I hope she likes this one. I totally pulled my inspiration from a card that Laurie made...I loved the color combo of PTI's Lemon Tart with Kraft and Chocolate Brown. You can see her card here. The layout is Taylor's Cupcake Sketch from last Friday (TECC41). It's a 5" square card, the yellow panel was stamped with SU's Sanded BG stamp, and the white panel on the left is PTI's Linen Vellum CS. Both Kraft scallop panels are up on dimensionals. Have you seen who the newest dirty girls are yet?? The new SCS Fan Club gallery opened today! Welcome Joanne Basile and Beverly Rousch!!! So excited to see you in the pile, girls!! Hi everyone! There's a new stamp company premiering today called Our Craft Lounge!! The stamps on my card are from a set called Bubs Beaver....awesome cling cushion rubber that comes cut out and ready to be used on your acrylic blocks. They stamp beautifully and I think Bubs is sooo cute! The image was stamped in Memento Cocoa and colored with Copic markers (numbers are in the recipe below). The Chocolate Chip mat behind the main image is up on dimensionals and so is the sentiment. An extra heart brad was added to the tree before it was glued down. I'm sorry I don't have a picture of the inside of the card to show you. I took several pics but they're all blurry. I was going to go outside and take more, but...well...it's raining. Bummer! I can tell you what's on the inside though....a 4" x 5.25" Very Vanilla panel was glued down. Then along the bottom edge there's a 1" Really Rust strip matted with Chocolate Chip. On the Really Rust strip, I stamped the long leafy log image and the small trio of hearts from the Bubs Beaver set in Versamark. Hi everyone! 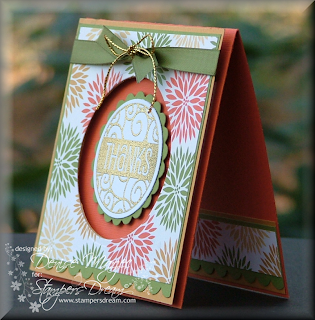 Have you seen all the gorgeous JustRite projects from the Stamper's Dream DT this week? I'm so excited to be part of such a great team...they're all awesome!! My daughter is going to be a bridesmaid in a wedding in a couple weeks, and she asked me to make her a lavender wedding card. This Mr. & Mrs. sentiment is part of the JustRite Classic Circle II Stamp Ensemble. 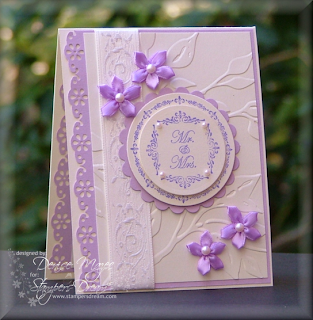 I stamped it in Lovely Lilac ink onto Poison Ivory Shimmer CS twice, cut out the inner portion with a Nestabilities circle and then cut a second one with a larger circle die. They're each layered on dimensionals over a Pale Plum Nestabilities scallop circle. I picked up the satin flowers at Michael's and added some Kaiser Craft Pearls to the centers of the flowers as well as the Mr. & Mrs. sentiment. The background was embossed with the Leafy Branch Cuttlebug folder. Hi everyone! As soon as I saw today's SCS Sketch, I knew EXACTLY which stamp I wanted to use...Love when that happens! I stamped the Northwoods Three Candles stamp in Memento Tuxedo Black and colored it with Copic markers. 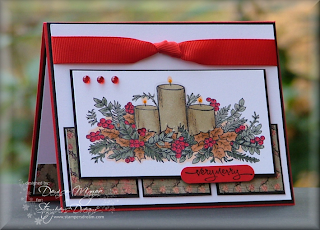 I stamped a second image, colored just the candles, cut them out and paper pieced them for a little dimension. The black mat behind the main image is up on dimensionals. Each of the flames has a very small dot of orange Stickles. The red rhinestones were glued down with a small dot of Crystal Effects. The inside of the card has a white panel matted with basic black, then I ran a 1/2" strip of the Wassail DP along the bottom edge. JustRite week at Stamper's Dream is still going on, so don't forget to check out the amazing (and I do mean amazing!) projects that Michelle, Tosh, and Amy posted today! Hi everyone! 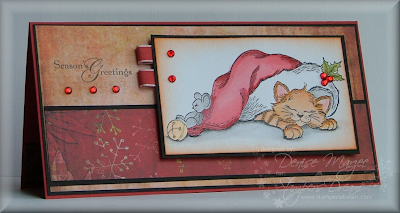 This is a card I made for Sunday's Featured Stamper, which was my fellow TSG girl, Wendy (wendybell)!! CONGRATULATIONS, Wendy!! I was so excited to see you were picked. Your gallery ROCKS! I chose to CASE this card that Wendy made back in September. I kept the same layout with all the white space and embossed edge. I changed the colors, added a Wassail Glazed Brad, and used my Tea for Two Special Blend stamp set from There She Goes. The peppermint sticks were stamped in Real Red ink and then I watercolored some Mellow Moss ink in the centers with a damp watercolor brush. 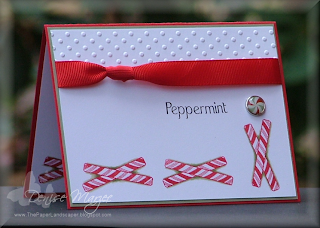 I stamped and watercolored the peppermint sticks once again on the inside of the card, down in the lower left-hand corner. The ribbon is from Taylored Expressions.